Having now heard the claims that Assad has used chemical weapons against his own people or againstWestern-backed death squad fighters on numerous occasions only to find shortly thereafter that those claims were either entirely fabricated or that the death squads themselves were the responsible party, the chemical weapons lie now stands as the false narrative that the West simply refuses to let go. 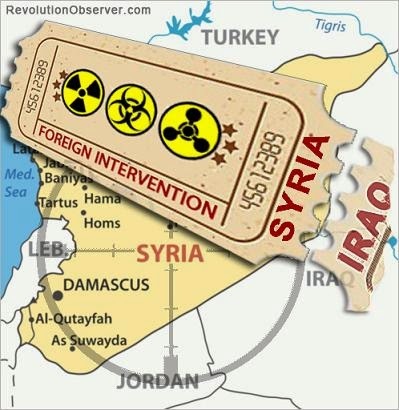 Thus, the recent attempt by Western governments and their media mouthpieces to suggest that Iran is supplying the Syrian military with chlorine bombs to use against death squad forces should, at least initially, ring hollow. For instance, in articles such as “West Fears Iran Is Supplying Chlorine Bombs To Syria” by Con Coughlin of the Telegraph, it is suggested that Iran has ordered 10,000 chlorine canisters from China and funneled them to the Syrian government via a regular air freight route between the two countries. The sole source of this information provided by the Telegraph is a report by the Israeli military news agency Debkafile. Beyond that, there is the citation of “Western security officials” and vague reports of “photographs provided by intelligence satellites” in order to bolster the claims that the flights between Iran and Syria are shipping chlorine weapons. Indeed, all the evidence provided (if it actually exists) only seems to indicate that regular flights have taken place between the Iranians and Syrians, not that any particular weapon has been delivered to Syria. The claims of chlorine weapons shipments are entirely based on Israeli intelligence statements made through Debkafile, an untrustworthy source information to begin with, as well as the speculation and unfounded assumptions by Western governments. Of course, flights between Syria and Iran are not out of the ordinary since the two countries have had friendly relations for some time, especially since they were united by finding themselves in the Anglo-European/Israeli crosshairs. In addition, there is no real evidence that Iran ever shipped the canisters to Syria. There is only the alleged evidence that 10,000 canisters of chlorine were ordered from China. This is hardly an open and shut case, no matter how much Western media would like to push the fantasy of more “proof” of Assad’s chemical weapons use. Truly, intelligence reports regarding WMDs and vague satellite photos should be enough to give any American flashbacks to 2003. The most ludicrous propagandistic claims, however, are the assertions by Western media outlets like the Telegraph that Assad was responsible for the Kafr Zeita chemical weapons attacks. For instance, writers and commentators like Con Coughlin, have all but lowered the gavel on their judgment that the Syrian government was responsible for the Kafr Zeita attacks. However, what is being completely ignored by these outlets is both the possibility and high probability that the Syrian government was not responsible for the chlorine gas attacks to being with. Indeed, there are several reasons to doubt the claims made by Western governments and Western media outlets, aside from the fact that both of these institutions have lied on repeated occasionsregarding the use of chemical weapons in Syria. Since the Ghouta chemical weapons attack drew Syria to the brink of war with the United States and NATO. Why would Assad use chemical weapons after that experience? Why would Assad use chemical weapons when he is clearly winning? Indeed, this was one of the main questions surrounding the flawed reasoning that sought to blame Assad for the Ghouta chemical weapons attack. Yet the Syrian military is even better off militarily at the time of the Kafr Zeita attacks than it was during the Ghouta controversy, thus making any attempt to blame the Syrian government for the deployment of chemical weapons in Kafr Zeita even more implausible. Second, although corporate media outlets such as TIME and ABC confidently report that Assad is the most likely culprit in terms of the Kafr Zeita gas attacks, the fact is that there is no evidence for these claims whatsoever. In fact, the entirety of the evidence cited by these mainstream outlets revolve around information provided by pro-death squad NGOs or by the death squad operatives themselves. Clearly, these sources are hardly impartial observers. Nevertheless, death squad forces uploaded a series of videos to YouTube that included footage of civilians suffering from what appears to be the inhalation of toxic gas as well as one young boy who has allegedly died from the chemicals. None of this footage, however, shows anything incriminatingto the Assad government. Perhaps the most important fact surrounding the recent chemical attack is that the death squads operating in Syria have a history of using not only chemical weapons in general but chlorine gas specifically. CL17 is normal chlorine for swimming pools or industrial purposes. It is rated as Level 2 under the chemical weapons convention, which means it is dual purpose - it can be used as a weapon as well as for industrial or domestic purposes. Level 1 agents are chemicals whose sole use is as weapons, such as the nerve agents sarin or tabun. There has been extensive experimentation by insurgents in Iraq in the use of chlorine, which is harmful when mixed with water to form hydrochloric acid. It vapourises quickly, meaning that in a big explosion it will evaporate; in a small blast - for instance, one delivered by a home-made rocket - it will turn into airborne droplets before dispersing quickly. One can only hope that the American people have grown immune to this type propaganda since the tired line of “chemical weapons attacks” and crimes against humanity has been repeated so many times in the past, only to find shortly thereafter that it was the so-called “rebels” who were responsible. What is plain to see, however, is that, no matter how bumpy the road may get, the Anglo-European powers have no plans to stray from the Path to Persia.